Providence, RI (3/18/2010): WSBE-TV Channel 36 will broadcast When the Reds Ruled the Roost, the story of a 50-year hockey love affair between a team and its thousands of passionate fans, twice in April. The program is scheduled for airing at 7 p.m. Saturday, April 10, and 11 p.m. Sunday, April, 11. 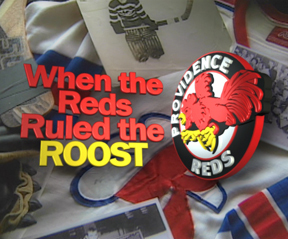 When the Reds Ruled the Roost includes film from every decade starting in the 1920s when the Rhode Island Reds were born. This 40-minute program includes rare film and photos of Hockey Hall of Famers Milt Schmidt, Johnny Bower, Ed Giacomin and Fern Flaman. Additional former hockey greats included in the program are some of the toughest guys ever to play the game like Jim Bartlett, Eddie Shack and Chuck Scherza. The program is narrated by Boston Bruins legendary announcer Fred Cusick and produced by Emmy award-winning and former television sportscaster Joe Rocco, President of RocJo Productions.